In the summer of 2016, Wes Clanton was looking for something to do. Which, if you knew him – and knew his crowded schedule – might have come as a surprise. Rotarian Wes Clanton, a merchant marine, and his teammates go by boat to meet with village elders. Clanton and his teammates show trainers that they can quickly and efficiently erect a ShelterBox tent. Clanton, center, and his teammates take part in a security-training exercise. Clanton and fellow ShelterBox Response Team candidates gather their belongings before an exercise. Clanton listens to lead trainer, Colin Jones, during a detailed briefing on upcoming exercises. Candidates had several 16-hour days during the training. Clanton shows some of his exhaustion during a late-night briefing. But an important aspect of Clanton’s life was missing. When he was a child, his parents had, as he puts it, “done mission trips,” and they had instilled in him the same passion to give back to his community, be it locally or on a global scale. That’s one of the reasons he joined Rotary. Nonetheless, he wanted to do more. “I was looking for an opportunity to volunteer, for a larger project that I could work on,” he recalls. That’s when a friend told Clanton about ShelterBox. Founded by a Rotary member in the United Kingdom in 2000, ShelterBox responds to natural and manmade disasters, providing temporary shelter and other essential nonfood aid to displaced people around the world. In 2004, after a tsunami left more than 200,000 dead in a dozen Asian countries, ShelterBox was there. As it was after the 2010 earthquake in Haiti and after Typhoon Haiyan devastated the Philippines three years later. More recently, ShelterBox assisted survivors of hurricanes in the Caribbean, displaced families in Bangladesh and Syria, and war-ravaged communities in Iraq. Not knowing what to expect, Clanton, now 33, decided to try to join the exclusive ShelterBox Response Team (SRT), which annually expects two three-week deployments from each of its 163 rigorously trained volunteers, about 20 percent of whom are Rotary members. But for Clanton, the challenge turned out to be part of the allure. He completed the application and, in the ensuing months, took the steps that would lead him closer to becoming a ShelterBox responder. About 350 candidates began the process along with Clanton. Eleven months later, ShelterBox invited only 20 of them to Cornwall, England, where a no-nonsense trainer announced, “This is your final exam.” One of those 20 was Wes Clanton. "The demands of the application were mind-blowing." Extending into the English Channel, Cornwall’s Lizard Peninsula is England’s southernmost point. During the training, the final candidates spend days in the classroom learning skills that may prove invaluable during their deployments. Divided into teams, they also crisscross Cornwall and deal with different disaster scenarios that simulate situations they might encounter. We pick a range of elements that will get them mentally and physically prepared to undertake that first deployment,” says Jones, who is assisted by three other trainers. “We’re here to throw them as many curves as possible,” adds Bruce Heller, a member of the Rotary Club of Allen Sunrise, Texas, USA. A veteran of 10 ShelterBox deployments, Heller is one of nine “shadows” here in Cornwall to monitor and mentor the trainees. Liz Odell is another shadow. A member of the Rotary Club of Nailsworth, England, she has been on 18 deployments. And miserable. Don’t forget miserable. Ned Morris is someone doesn’t get rattled when unexpected challenges are thrown at him. A wine-maker, a wine consultant, and an avid outdoorsman, he’s also something of a Boy Scout: He supplemented his yearlong ShelterBox training with a rugged 10-day wilderness program in Wyoming, and CPR and first-aid classes with the Red Cross. A member of the Rotary Club of Walla Walla, Washington, USA, Morris, 48, started out as a ShelterBox ambassador, traveling around the Pacific Northwest to raise awareness about, and money for, the organization. He also participated in the ShelterBox Ambassador Field Experience, a three-day event in Texas that simulates the deployment of a ShelterBox Response Team. With only his head-lamp as light, Ned Morris assembles a ShelterBox tent. Candidates worked late into the night preparing for the next day's activities. Here, Morris reviews a ShelterBox handbook. Candidates had to be in constant communication with the training team. Morris discusses his team's strategy with ShelterBox mentors. Morris, center, and his teammates assemble a ShelterKit during a training exercise. Morris stretches late into a 16-hour day. “We went through some of the hoops that SRTs have to jump through” – such as getting stuff out of customs – “and encountered a lot of the hurdles they have to deal with, like reporters with microphones in your face. It gave us a snapshot of what it’s like when they’re deployed,” he says. His appetite whetted, Morris applied to become a full-fledged ShelterBox responder, embarking on the same yearlong process as Wes Clanton. As a final step before the Cornwall deployment, he joined Clanton and 14 other applicants for a four-day field assessment outside Toronto. Clanton is tight-lipped about the experience – “I can’t say too many specifics about what actually happened” – but Morris is slightly more forthcoming. "That was the hardest part for me, knowing that we can’t help everyone – and knowing that when I am deployed, I’m going to be part of the team that makes those decisions." Clanton’s reticence is standard ShelterBox procedure. When I visited Cornwall, the organization wouldn’t allow me to see all aspects of its training, such as the nightly debriefing sessions. Nor was I allowed to report on everything I did see. Rotary and ShelterBox are project partners for international disaster response. A registered charity, ShelterBox is independent of Rotary International and The Rotary Foundation. Still, having seen the training procedures up close, and without tipping ShelterBox’s hand, here is what I would tell a candidate heading to the dismal barrens of Cornwall. Expect to eat little and sleep even less. Expect bad breaks and worse weather. Expect disquiet piled upon dread. Expect the trainers and shadows to both teach and test. Most of all, expect the unexpected – and then expect more of the unexpected immediately on its heels. That’s part of the rigor of the final exam. It’s a ShelterBox tactic – simulating what so often happens in real life – to follow up a dramatic, even dangerous situation with, say, a simulated high-pressure meeting with key representatives from the United Nations or some other humanitarian organization. No matter what they’ve just endured, trainees must succinctly answer detailed queries, while asking essential questions of their own. “You really have to stay focused,” says Morris. “You can’t be on autopilot. It was very taxing.” Even mundane tasks can take an unexpected twist, as when a police chief agrees to provide a necessary visa only if the trainees guarantee tents to police officers who have lost their homes in a flood, a violation of ShelterBox policy. Another scenario, set at a temporary shelter, prompted an unexpected emotional response from an Australian woman whose learning curve demonstrated just how effective the ShelterBox training can be. That’s a story I can tell you. During a late-night exercise Rotaractor Katelyn Winkworth, right, goes over tasks with her teammates. Winkworth reacts to the latest exercise instructions. The amount of information the teams needed to grasp during the training was dense. Winkworth slips poles into a ShelterBox tent. It's one of the first steps to setting up a tent. Winkworth reads her security document during a late-night exercise. Winkworth thinks about her team's strategy for the next day's training activities. Winkworth prepares a ShelterBox tent during one of the last exercises. 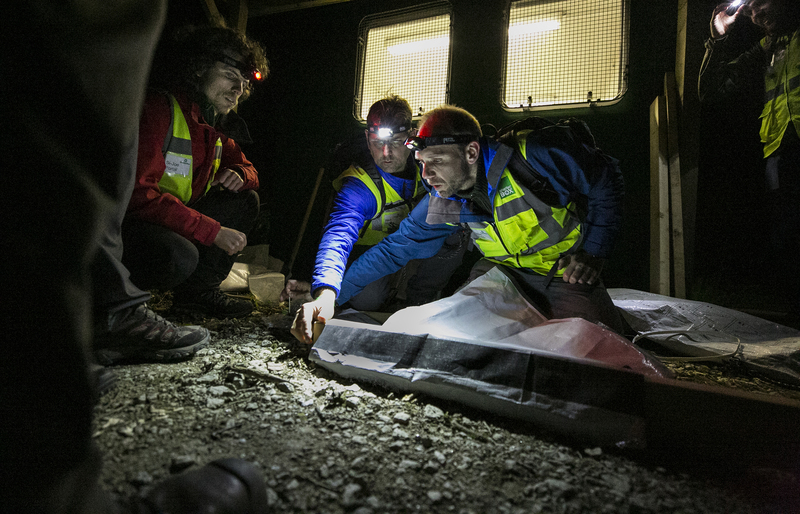 ShelterBox trainers judged how effectively the teams could put up a tent. Katelyn Winkworth inherited from her parents a zeal for performing good deeds. The president of the Rotaract Club of Brisbane Rivercity, the 27-year-old travels around Australia as a health promotion officer working with indigenous people. ShelterBox seemed a natural fit for Winkworth except for one problem: She lacked self-confidence. Colin Jones understands how the assessment – and the Cornwall session – can be overwhelming. That’s what happened with Winkworth. And that’s how she landed an invitation to Cornwall. Winkworth's team would often times huddle together to give each other words of encouragement and support. This helped with the team dynamic says Winkworth. But as the days passed and previously learned lessons kicked in, the team’s ability to collaborate improved. She also found herself emotionally engaged when her team visited a university repurposed as a temporary shelter for 500 people. In this scenario, the space was overcrowded, bathroom facilities were inadequate, and there was little food. “It really brought home to me what it’s like to be in the field, seeing distraught people who have had everything taken away from them: their families, the people they love, their homes. I got very choked up, even though it was a scenario,” she says. Her response reveals Winkworth’s prime motivation. After 10 long days, the training concludes. The ShelterBox candidates are exhausted, and, having subsisted over the past few days on meager rations called “rat packs,” they’re hungry. The ordeal has taken a toll, and not just on the trainees. As he presents the candidates with their ShelterBox Response Team ID cards – because, yes, all of them have passed the final exam – Colin Jones appears to be holding back tears. His tough-guy veneer has vanished. A few months later in Australia, Katelyn Winkworth awaits her first assignment. ShelterBox dispatched Wes Clanton to Madagascar in January after a cyclone killed more than 50 people and displaced 54,000. And in late February, Ned Morris flew to the Dominican Republic and Barbuda to spend three weeks evaluating the response to hurricanes Irma and Maria. “The concept that everybody has dignity is important to me, as is helping them retain their dignity on the worst day of their life."